Our capabilities in Mold Making include small and large injection molds from single cavity rubber prototype applications to production molds ranging from 2mm to 700mm. We also offer mold repair services. 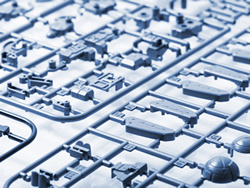 Each mold is engineered, designed, built, and pre-run with close coordination with our customers to produce the highest standards and quality. Our staff of over 40 years in combined experience is available to support your production, engineering, and design needs.